I fully support Mothership HackerMoms (The first women’s hackerspace) and was happy to donate to their Kickstarter campaign. Their goal was/is to construct a workshop with tools and equipment, and create a kids program and business incubator for moms. I think it’s a great idea. We are a new kind of playground and workspace for creative mothers. Fun to us is not mani-pedis, but making, breaking, learning and hacking our bright ideas. HackerMoms model active creative lives for our kids who learn, explore and create as mini-makers alongside us. We offer members daily childcare. We also welcome dads. I don’t think they have any plan to be exclusionary, and they certainly aren’t out to stop anyone else from doing their own thing. You want to start a hackerspace geared towards women who have chosen not to have kids, or for single dads, or for people who view their pets as their babies? Go for it. I’m sure they won’t try to stop you. And here’s the thing… we all have/had mothers. (Well, unless you were created in some other way, I know some people were.) Imagine being a kid and having your mom take you to a hackerspace, and growing up in that sort of community and culture. 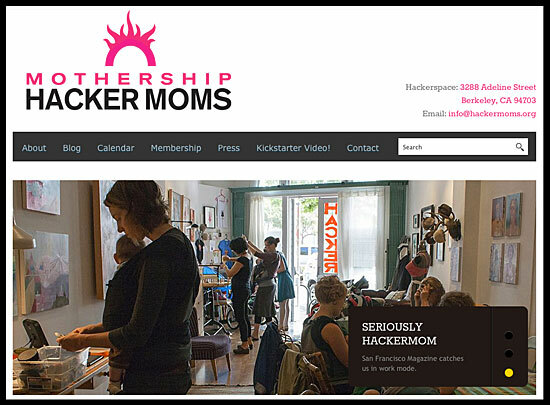 I can’t wait to see what the kids who frequent the Mothership HackerMoms space turn out like in 10 or 20 years. If you believe in creative spaces like these, support them, and let others know how awesome it is. One more thing… over at Milwaukee Makerspace we’ve talked about how to reach out to more people, men, women, robots, etc. We’re interested mainly in maker, and less about gender, but you can bet that if a bunch of women (or mothers, or men, or cats) came to us asking for advice on how to start their own space, we’d help them out. In fact, we’ve already done that a bit for Spring City Launchpad. We’re also hoping that our new space will be much more inviting to all kinds of people. I guess we’ll find out how that goes in 2013! Posted on Monday, November 19th, 2012 at 5:00 pm. Subscribe to the comments feed. Both comments and pings are currently closed. Post on your own blog.